There’s such a problem with Eurocentric terminology when discussing analogues to a Western institution found in other cultures. That’s no different than with orchestras. I’ve used the phrase “Ethnic Orchestras” in reference to large ensembles modeled after the European-styled Orchestra (e.g. Traditional Chinese Orchestras), but at the same time, some of these large ensembles are definitely found within European countries (e.g. Mandolin Orchestras). While my usage of these phrases help create useful distinctions between the various types of large ensembles, the term “Orchestra” itself is an ethnically specific one that arose out of a type of institution which has its own particular history. Ideally, it would be better to just used the designation in the original language of the group name, but that can also hide the fact that these large ensembles often serve a similar function as European-styled Orchestras in their countries of origin. For now, I’ll stick to the usage, but am open to suggestions for another way of discussing these large ensembles. That being said, I wanted to focus more on the Ethnic Orchestras and Non-Western Orchestras in this post, since I only touched upon them in the previous one about the evolution of orchestras. Two separate discussions prompted this. One right in the comments of the post itself initiated by Joe Patti of Butts in the Seats, and another on Facebook via a posting of the blog to his timeline (tagging me) by composer, Dennis Báthory-Kitsz. I’ll start with the latter in this post and focus on the former in the next post. In a comment on Dennis’ post, I mentioned that I should have included an example of a Bulgarian Folk Orchestra in my post. The one I posted there was of the Bulgarian National-Radio Folk Orchestra. I often used Bulgarian Folk Orchestras as an example of Soviet inspired Arts cultivation. Many of the satellite countries of the Soviet Union developed a fusion of their indigenous folk arts and Classical Music. I mentioned two other examples in the post, Azerbaijan Mugham Opera, and the Georgian National Ballet. In Bulgaria, the folk music became nationalized and institutionalized and taught in the universities. In some cases, these orchestras were better funded than the Western Classical Music Orchestras that existed. At the same time, it is clearly modeled after a European-styled Orchestra in a similar way that, say, the Traditional Chinese Orchestra is modeled after a European-styled Orchestra. I’ll say more about the Traditional Chinese Orchestra and how that differs from the indigenous yayue ensembles (some of which historically had up to 200 musicians) in the next post when I discuss Joe Patti’s comment. …from the 1930s to the 1980s we’ve seen fragmentation and fusions from European Style Orchestras (and, tangentially, mandolin orchestras) into: Arabic Orchestras, Traditional Chinese Orchestras, Azerbaijan Mugham Orchestras/Operas, Baroque Orchestras, Guitar Orchestras, New Music Orchestras, Soundpainting Orchestras, Telematic Orchestras, and I’m sure other styles/genres I’ve yet to come across, or that are isolated (e.g. The University of Wisconsin Russian Folk Orchestra or the LA Drita Albanian Folk Orchestra). I’ve since discovered that Russian Folk Orchestras aren’t so isolated after all. Ever since the first Russian Folk Orchestra was created by Vasily Vasillevich Andreyev (1861-1918) in the 1880s, these orchestras have waxed and waned throughout the world. I’ve come across at least a dozen of these orchestras in the US and one of the problems with searching for these is that most of these ensembles are referred to as Balalaika Orchestras (since the Balalaika, like the Mandolin in Mandolin Orchestras, functioned as the “string sections”). So, much like the Mandolin Orchestras which emerged contemporaneously with the Balalaika Orchestras, we’ve seen them grow into fairly international phenomena while including instruments indigenous to a specific country/region. 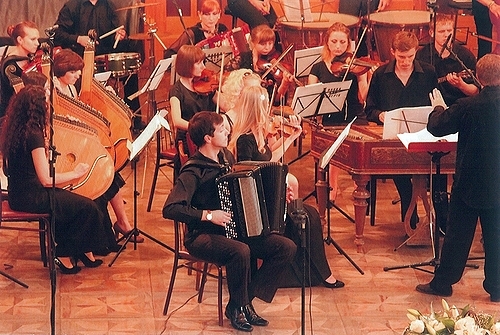 In addition to balalaikas, Russian Folk Orchestras regularly include domras, and occasionally other folk instruments like the bayan and gusli (not to be confused with the Serbian gusle). A recent addition to the Balalaika Orchestra is the American Balalaika Symphony Orchestra, an orchestra which includes a complement of Winds and Percussion–which makes the analogy to European-styled Orchestras all the more prominent and gives a different range of expression and newer opportunities for a varied repertoire. While searching for Russian Folk Orchestras/Balalaika Orchestras, I came across several sites with images of folk instruments. One of these, the Ukrainian Kobza, I’d run across before several years ago–in a Ukrainian Folk Orchestra! Doing a quick search, I couldn’t find the page where I first saw that orchestra, nor could I find any vids of Ukrainian Folk Orchestras. I did, however, come across the image below from this site where you can clearly see kobzas. Those are likely a bass version of the Kobza which is roughly the size of a lute–one of the things we’re seeing in the types of folk orchestras is the creation of a whole family of instruments to mimic the various members of the Violin/Viol family in Western Symphony Orchestras. A similar effect happened in Traditional Chinese Orchestras (see my old post about Chinese Cellos to see all the various attempts to modify folk instruments into a cello-like instrument for these orchestras). Also while doing this search, I came across a Tamburica Orchestra, which are apparently even more numerous in the US than Balalaika Orchestras. The first Tamburica Orchestra was created in 1847 by Pajo Kolarić during the Illyrian movement of the Croatian National Revival (Hrvatski narodni preporod). The movement was designed to promote Croatian literature and culture and Tamburica Orchestras flourished after Ottoman occupation. Outside of these countries that border Europe and the Ottoman Empire, or border countries of the Soviet Union, we find similar orchestras using native folk instruments configured in “string sections” as in European Orchestras. I mentioned Traditional Chinese Orchestras and Arabic Orchestras, in the previous post. Here’s a Mongolian Morin Khur Orchestra. Here’s the Pan African Orchestra. Here’s the Vancouver Inter-Cultural Orchestra (VICO). Here’s the Multi-Ethnic Star Orchestra (MESTO) of Los Angeles. These last two (VICO and MESTO) are part of a new trend fusing many world musical cultures into one ensemble of mixed instruments from more than just the two (e.g. an indigenous country’s Musical Instruments and Eurpoean Orchestral Instruments). Obviously, Yo-Yo Ma and the Silk Road Project would be part of this “Intercultural Orchestra” trend so this might be the latest iteration of Orchestral Evolution informed by music from all over the world. Maybe I need to add a third post to this series focusing solely on Intercultural Orchestras? One thing we can learn from these orchestras and how they’ve proliferated in the US (and around the world) was due to the timing–Mandolin, Tamburica, Balalaika Orchestras all emerged and flourished during the Industrial period and especially when immigration to the US was more open to Europeans. This trend is easier to report than to explain. The trend does coincide with the increasing demographic heterogeneity of the U.S. population, particularly in the cities that typically support orchestras. In the words of one observer: “The ethnic groups that do not trace their roots to Europe will increasingly affect the definition of national cultural values. The traditional value system associated with classical music concerts is not universal, but derived from a European cultural heritage. The style of concert performances may not appeal to members of ethnic groups” (Kolb 2001, p. 20). The distinctly smaller proportion of ethnic minorities attending classical music concerts in the United States is consistent with this view. There is a certain irony in this development, since earlier generations of immigrants stimulated the formation of early U.S. orchestras in the 19th century. The early US Orchestras, and other European Classical Music institutions, were formed mostly by immigrants from countries where Classical Music was much more centrally a part of their ethnic cultures–with repertoire primarily from said countries (England, France, Germany, Italy). The genre name forms still belie the ethnic origins (e.g. Ballet from the French, Opera from the Italian) and regions of development. These non-central European Countries sometimes overlapped the periphery of the West in what was primarily part of the Ottoman Empire. The Tamburica is simply the Croatian version of the Tambur which is one of the primary plucked lutes of Central Asia, Turkey, and parts of the Balkans. Once we get out of the periphery of Europe we find the emergence of Large ensembles like the Traditional Chinese Orchestras, Morin Khuur Orchestras, Pan African Orchestras. But this is a two way streak. In the next post I’m going to talk about traditional non-Western Orchestras taking as my starting point Joe Patti’s question about historical large ensemble forms in China. Next What’s it like playing for 50,000 people? Do you think the designator “band” or “ensemble” carries markedly different connotations than “orchestra”? Would the difference be size (an orchestra is assumed to be bigger than a band or ensemble, with multiple players on a part)? Would the difference be repertoire (an orchestra plays learned/classical/courtly musical repertoire, while a band plays popular/folk/common repertoire)? That high/low art distinction definitely exists in various non-Western cultures. But then, how do the Russian, Bulgarian, and Ukrainian folk orchestras you mention fit into that model, since they seem explicit about preserving folk traditions? Or maybe the difference is in operation: an orchestra (in the Western model) would play fixed notated compositions, with small amounts of improvisation/arrangement as appropriate, led by a conductor/director; while a band/ensemble might work from a loose transcription/lead sheet and build its own arrangement on the fly, with significant amounts of improvisation, restructuring, soloing, vamping, etc. being worked out in rehearsals, with comparatively less direction by a leader. Here at UO, we had an ethnomusicologist on the faculty who specialized in Balkan and Eastern European folk music, and every winter term he offered a performance ensemble that he called a “Balkan and Eastern European Folk Band.” (He retired 2 years ago, so the ensemble is no longer offered, unfortunately.) I had the pleasure of playing cello in it one year. There were 20-25 musicians, so it was a little bigger than the Bulgarian Radio Folk Orchestra in the YouTube clip above, and we had multiple players on most instruments (clarinets, trumpets, violins, and saxophones on melody, and guitars, cellos, and tubas on bass/rhythm; only one drummer, though.) But we played off of the director’s simplified melody & bass transcriptions, we were expected to freely add in the intense improvised ornamentation typical of that repertoire, melody players were expected to take solos (with lots of improvisation! ), and we constructed an original roadmap for each song in rehearsals. I think those differences in the operation of the ensemble were probably the main reason why the director called it a “band”– and they were significant differences for an ensemble made up of students at a 4-year accredited school of music, where all of the other large ensembles (except the jazz groups) function on the Western classical model. And then we performed for an audience that included many people from our thriving local folk dance community, so it was pretty clear in the concert (as soon as the dancers got going) that we were playing music that served a different social function than orchestral music. Do you think the designator “band” or “ensemble” carries markedly different connotations than “orchestra”? Would the difference be size (an orchestra is assumed to be bigger than a band or ensemble, with multiple players on a part)? Yeah, definitely–“band” and “ensemble” both have other culturally specific connotations too. Just taking “band” for example–some of the early 20th century “Big Bands” were as large as any Mahlerian sized orchestra, and certainly some Concert Bands are (I also find it interesting that Concert Bands almost always get left out of the discussions of Classical Music). “Ensemble” is a little more neutral, and may be the most useful when the group isn’t being obviously modeled after a Western Orchestra. Would the difference be repertoire (an orchestra plays learned/classical/courtly musical repertoire, while a band plays popular/folk/common repertoire)? That high/low art distinction definitely exists in various non-Western cultures. But then, how do the Russian, Bulgarian, and Ukrainian folk orchestras you mention fit into that model, since they seem explicit about preserving folk traditions? This is another significant difference–many of these folk orchestras are about preserving folk music. We could actually argue that Classical Music is just another type of folk music–especially as the repertoire/canon is centered on very specific regions of Europe, and that Classical Music Groups are just preserving that folk art tradition–but that’s besides the point here. While that seems to have been the primary purpose–the preservation–many of these organizations are also doing transcriptions of standard classical rep. Often from composers native to the country of origin of the folk orchestra. Also, what I’ve noticed about many of these groups is something that happened with percussion ensembles in the 20th century. There rep for these groups is relatively small, and while there have been some composers for them at the beginning, these groups are constantly doing new works written specifically for their instrumentation. Many of the US groups are premiering works on practically every concert–or works written for that type of ensemble fairly recently. Rarely do we get new works performed by traditional Classical Music ensembles–and new music groups almost invariably play, well, new music–which is often composed for the very idiosyncratic ensembles (e.g. a piece written for Bang on a Can’s instrumentation would be difficult to reproduce by, say, the Kronos Quartet without hiring extra musicians). So I think these Russian/Ukrainian/Croatian/Italian folk orchestras are in many ways not as highly specialized as current Classical Music groups are, and perform the function of all the various specializations. I think the Intercultural Orchestras have taken that a step further, but it seems to be the logical end point of where folk orchestras have started. Or maybe the difference is in operation: an orchestra (in the Western model) would play fixed notated compositions, with small amounts of improvisation/arrangement as appropriate, led by a conductor/director; while a band/ensemble might work from a loose transcription/lead sheet and build its own arrangement on the fly, with significant amounts of improvisation, restructuring, soloing, vamping, etc. being worked out in rehearsals, with comparatively less direction by a leader. Your experience with the Balkan Band is something that is one of those issues many of these groups, as well as other traditional music ensembles, are struggling with. As they become institutionalized and taught in a classroom/university type setting, this moves away from the more aurally/orally transmitted nature of instruction. Notation has become necessary for that. I remember reading many papers about the struggles that Indian and Thai Classical Music (another problematic phrase to use in these contexts) that had to move from the guru to student relationship to a university classroom setting and how many of the older master musicians bemoan the fact that the music has to be written down at all and how that implicitly changes the nature of the music (since the improvisational element gets left out). The problem is, once you have a group of instruments playing the same line, you need to formalized the ornaments and embellishments and curb the improvisation–with a hundred instrumentalists doing different ornaments, it could get cacophonous–which would also destroy the integrity of the music. All of this accompanies the shift of function–once you’re interested in preservation, you’ve moved to a different social function than, say the active communal participation of everyone. I believe I’ve heard some bellydancers say the same thing about staged shows as opposed to, say, restaurant dancing. Different environment, different function. On the other hand, there are models that have experimented with bringing back improvisation and active participation of multiple media or performers–I don’t know if you’ve read anything I’ve been saying about Soundpainting Orchestras and Improvisatory Orchestras, but that’s been taking off since Walter Thompson created the first one in 1974. An example you might appreciate is cellist, Gil Selinger’s, Soundpainting Improvisations on the Haydn Cello Concertos and Shostakovish Cello Concerto–the whole orchestra and soloist are riffing on the original compositions. Oh! One more thing about your comment about the size, Ann–I guess we do make a distinction between Chamber Orchestras, Concert Orchestras and Symphony/Philharmonic Orchestras. I recall while reading a lot about the WPA period of orchestra formation during the depression, there was an official distinction between Concert Orchestras (less than 50 players) and Symphony Orchestras (more than 50 players), but it was never a hard and fast rule–i.e. there were many Concert Orchestras with more than 50 players and several Symphony Orchestras with fewer than that.